Overcoming our Aversion to Acknowledging our Ignorance. See the reaction essays as well as the original piece by Dan Gardner and Philip Tetlock. How to find a topic for an economics research essay by Frances Wooley. Grade inflation: why weren’t the instructors all giving A’s already?? by Andrew Gelman. See my old post on grade inflation here. “Circles” – just foci renamed/repurposed? Steven Kahl has an interesting post up at OrgTheory about the way Circles play a key role in the (current and potential future) differences between Facebook and Google+. I was with him, right up until he invoked Watts and small worlds. This (along with scale-free degree distributions) is one of the most over- (and mis-) used concepts from the network literature. * While i think i see what he’s getting at, Circles seem, in small worlds parlance anyway, to be much more closely aligned with the concept of clustering. Now, clustering does play an important role in the small world effect, clusters are just part of the small world story. And frequently they are interesting in their own right, not simply because of how they are linked to the small world pattern. Perhaps that’s what SK is pointing out – that they are similar to clusters, but i think there’s something better already out there, and since clusters can arise for reasons that would seem consistent with Circles and with ones that aren’t, i think the pointer is potentially slightly off. More importantly though, like i said, i think there’s something better. Circles much more closely reflect a much older (and, oddly, much less frequently used) concept from social network literature – that of foci as addressed by Scott Feld in 1981 (AJS 86:1015-1035). This point was made on Twitter a few days ago (HT: Brian Keegan, via Barry Wellman). While that paper (along with a few others of Feld’s) are frequently thought of as classics within the networks community, i am surprised at how little-known they appear to be outside it. Fundamentally, Circles seems to be an attempt at leveraging one of the key constructs of network development, which Feld highlighted 3 decades ago. Think he can claim royalties? *This isn’t to say there aren’t great ideas in those two concepts. There are. It’s just that there’s a lot more to the network literature than them, and attempting to shoe-horn every observed network pattern into one of these two frameworks has become so common that i think we’re often losing some of the important things about observed empirical networks. In a case in which the other shoe took a very long time to drop, Marc Hauser, the Harvard psychology professor renowned for his work on moral judgment, apparently has resigned after a protracted dispute regarding “scientific misconduct” that included retraction or post-publication-revision of three papers because of data problems. I think I’m starting to resolve a puzzle that’s been bugging me for awhile. I understand why Gelman finds these types of arguments somewhat contradictory, but its possible they can each be true in different cases. After noting the tension between the two, what needs to be done is to identify a representative sample of such cases and see in what share of the cases the analysis is correct. Admittedly this isn’t an easy task, but it doesn’t seem to me much of substance has been shown based on Gelman’s observations (interesting though they may be). Stan Wasserman mentioned a graphic from a Grantland article that was basically a visualization of a 2-mode matrix representing actors who have appeared in multiple HBO shows. Since i’m a fan of a handful of HBO’s shows, and i thought this might make for an interesting example in my undergrad networks class, i went ahead and turned the graphic into a usable network file. * You can grab the full matrix as an Excel file (which should be pretty easily importable into basically any format you prefer to use) here. I’m futzing around with analyzing the network a little, but I don’t actually work directly with 2-mode data a lot*** so i haven’t gotten too far in thinking about this one. So, if you feel like grabbing the data and find anything interesting in there, please let me know. 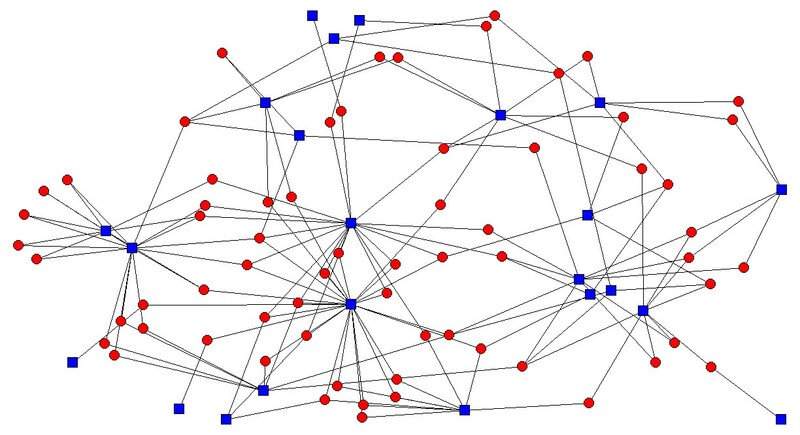 Above is an unlabeled version of the full diagram (where lines simply represent an actor – red nodes – appearing in a particular series – blue nodes). 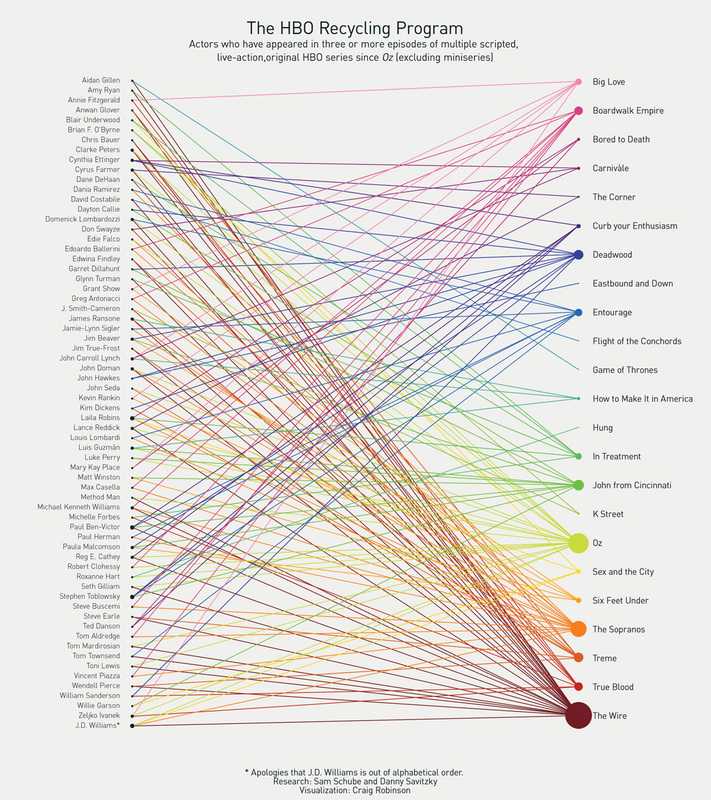 If you’re a fan of HBO shows, can you make any guesses about what you see (same image with labels after the jump)? So, the basic question here is about your writing process. What does it look like? Rough sketch is great. Detail is fine too. You are currently browsing the Permutations blog archives for July, 2011.